NOTE - This jailbreak is not for those that need to or plan to unlock. DO NOT USE THIS JAILBREAK IF YOUR IPHONE RELIES ON AN UNLOCK. 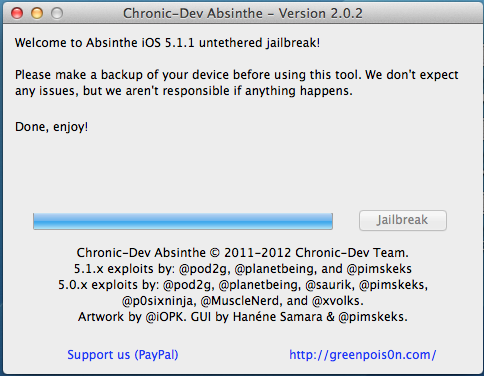 stay away from Absynthe Jailbreak. Here is the link for Jailbreaking for UNLOCKERS. There are some very good articles on how to jailbreak but many miss a couple of steps that new jailbreakers need to know especially when it comes to using Cydia - the resource for finding and installing jailbroken apps. This tutorial tries to help those first time jailbreakers by covering both the jailbreak process step by step and also how to use Cydia to install an app. Do not try to jailbreak if you don't like when things go to (expletive). If you need your device for your business and being without it for any period of time will cause you to loose your job - stop now. If you get mad at your significant other at how they fold towels or put the toilet paper on a roll - Jailbreaking is probably not for your personality. Sometimes things break and your device will likely crash more often then if it was not jailbroken. Apple "claims" jailbreak voids your warranty if that is an issue stop now. Note Squaretrade's warranties still cover jailbreaking. Step 0 - Before you start make sure you update your iOS device to iOS 5.1.1 if you have not done so already. If you do not know how to update your iOS device jailbreaking may not be for you. If you are already updated to iOS 5.1.1 make sure you do a sync and backup of your iOS device. If you have any photos or video you shot - transfer those now to your computer from your camera roll. Also force quit every open App on your iOS device and then go to settings and general and then go to Reset and select "Reset Network Settings". This will then reboot your iOS device. Next connect your iOS device via the USB cord directly to your computer - not through a USB hub or keyboard or Monitor - right to the computer. Step 1 - Close out iTunes on your computer. Make sure your iOS device is still turned on and connected via the USB cable - per Step 0. 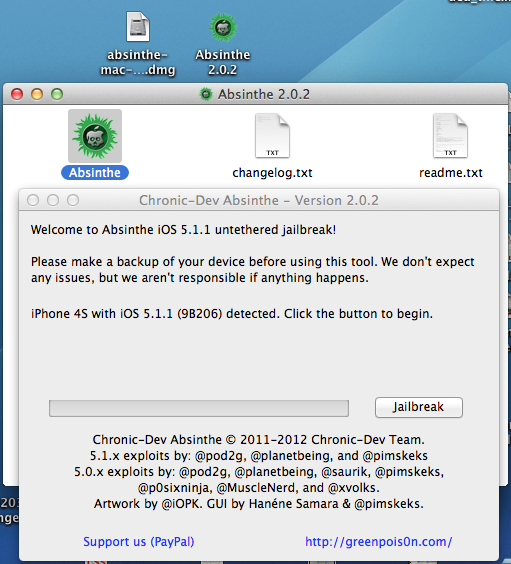 Step 2 - Download Absinthe 2.0 from the links below and unzip the file. Step 3 - I recommend closing out all of your open programs and restarting your computer before proceeding. If you have iTunes set to launch when you connect your iOS device - you will need to quit out of iTunes again. Step 4 - Per the iPhone dev teams recommendation - "Once your backup is complete return to your device and go to Settings – General – Reset – Erase all Content and Settings. This will make the jailbreak process much faster." Make sure you keep your iOS device connected to the computer via a USB cable - also make sure it is connected directly to a USB port on the computer and not via a USB hub nor a USB port on a keyboard nor monitor. Also make sure your device is re-activated before proceeding. Note: If you are using Test Flight to get beta versions of apps for testing on your device - they will be removed if you erase all content and settings - and you will need to manually reload each app at the end. 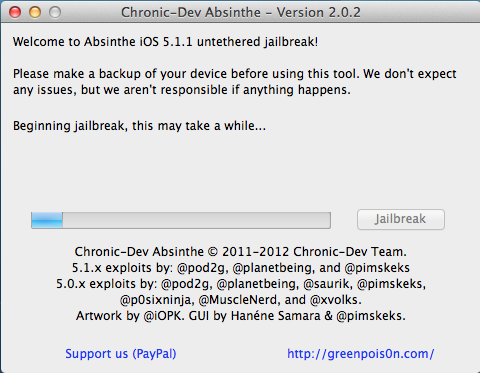 Step 5 - Launch - GreenPois0n Absinthe 2.0.2 - and select "Jailbreak"
Step 5 continued - Sit and Wait. After you click Jailbreak above you will see some messages about the status of the jailbreak (see below). Step 6 - You will eventually (5 minutes typically - could be more or a little less) see the message below. You will need to unlock the screen and then find the Cydia icon on your iOS device - it is a brown icon - with "Cydia" below it. Sometimes however in the past it has been an all whitie icon. If you see this - you have a jailbroken iPhone. Step 7 - Once jailbroken, open iTunes and restore your backup from earlier. When you open iTunes it should take you to the option to "Set up your" iOS device - Select "restore from the backup of: " with the correct backup choosen. Then click continue. If it does not show up - then Right click on your device name under the ‘Devices’ menu in the left panel of iTunes and click ‘Restore from Back Up…’ then select the latest backup you created before. Restoring this backup will return all the content previously on your device ie, apps, photos, etc. This is the longest part of the jailbreak - and depending on how much content there is to get back on your iOS device it could take a while - it took over 2 hours for me. Once you confirm your restore from back up worked correctly go to step 8. Step 8 - Launch the Cydia App. The first time you launch it you will see a message "Preparing Filesystem (cydia weill exit when complete)" - and per the message Cydia will quit out / exit when done. Once it does this - relaunch Cydia. The second time you launch it you will be asked "Who Are you?" with the options of "User", "Hacker", "Developer" - if you are reading this - select "User" and then tap "Done"
Step 9 - Once it is done it will open up and you should see a screen that looks like that below. One App almost everyone will want and that works on the iPhone's, iPod Touch's and the iPad is the app SBSettings. This moves important settings / controls to the notification dock where they are always quickly available. To install this app Tap on "Search" in the bottom row of Cydia and then in the search box type "SBSettings"
Next Tap on "SBSettings" the top one - not the one any of the others. Then Tap on "Restart Springboard"
Then in the Settings App under Notifications - Go to SBSettings and turn it to "On". Next launch the SBSettings app - and look at all the options. Thats it you are now jailbroken and have your first real jailbroken app running on your device. Please understand sometimes installs of apps are interrupted - in which case you need to try and re-install. Things are not as stable when you jailbreak - expect some additional crashes and conflicts between apps. Which is why if you install an app you no longer plan to use - it is best to delete said app - the more jailbroken apps you have installed - the higher the probability you will have a conflict. Note: If you have an iPad - do not - repeat - do not - install Five icon dock - it will really mess up your iPad and you will need to restore it. However that app works great on the iPhone and iPod Touch.